Some of Flags Australia's members are retailers of flags in Australia. Information about those members who are involved in the flag industry is set out below. Flags Australia recommends that everyone interested in flags and vexillology support those flag retailers and manufacturers who are sufficiently interested in their products to belong to Flags Australia. Adware Flags, first established in 1983, are proud Australian manufacturers of the highest quality screen printed, hand sewn appliqued and digitally embroidered flags of standard or custom made flag designs. Owned by Jason Coulter, with a uniquely dedicated core business model to produce & supply the finest quality Indoor and outdoor flagpoles, flag pole stands, table flags, wall flagpoles, timber flagpoles, wooden flagpoles, marching, ceremonial flagpoles. Aluminium telescopic flagpoles, flagpole rope and flagpole parts. Industrial, commercial and aviation windsocks, workplace safety windsocks, wall mount, inground windsock poles, windsock frames, windsock hoops, portable windsock poles. Adware also offer professional flagpole repairs, maintenance and flagpole servicing. A quality assured flag maker to the Australian Defence Force. Australiana Flags is owned and operated by Warren Cardwell. Australiana Flags specialises in supplying the Australian National Flag in all sizes and at the highest quality and a full range of international flags, corporate and custom designs. It also supplies other Australian historical and heritage flags, including a range of flags for Australians of Anglo-Celtic descent. 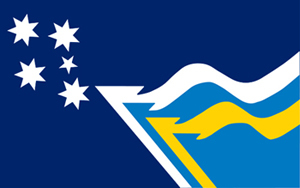 Australiana Concepts is the flag design and research consultancy of John Christian Vaughan and he describes himself as a vexillographer. He has designed numerous heritage, municipal and personal flags and he has wealth of knowledge and experience with flags. John was the owner operator of Australiana Flags from 1986 to 2017. He is the leading expert on Australian current and historical flags, etiquette and protocol and he is a frequent guest speaker and commentator on flags. John is the national spokesman for the Australian National Flag Association. Carroll & Richardson Flagworld is one of Australia’s leading flag manufacturers, stockists and retailers, serving over 15,000 satisfied customers for over 50 years. They are one of the few flag companies with a fully stocked warehouse and on site manufacturing. They have one of Australia’s largest range of Australian, Aboriginal, Torres Strait, International and Commercial flags. This allows them exceptional quality control as well as fast printing and delivery. They produce Australian made flags, banners and bunting and are a member of the Australian Made campaign. They digitally and screen print on a range of fabrics including vinyl, knitted polyseter and woven polyester in various sizes. Hand sewn appliqued standard and custom made flags and banners are also available. They work with a wide range of customers to create customised flags and banners to promote their businesses and brands. Carroll & Richardson Flagworld are proudly an Australian company with the exclusive worldwide rights to manufacture the Aboriginal Flag. 22-24 Miles Street, Mulgrave, VIC 3170. Christies Pty Ltd is a retailer of flags and militaria, established in 1895. A range of Australian flags are stocked in various sizes and materials, together with international flags in printed or sewn polyester. Hand wavers, desk flags, car flags and flag accessories are available. Custom design banners and pins can also be ordered. Christies has a full range of Australian medals and ribbons, military badges, insignia, plaques, flag patches, accessories and clothing. Flag Monkey is an online retailer and wholesaler of quality screen printed polyester and trilobal flags. It stocks a comprehensive range of Australian, World and Novelty flags in many sizes from desk-flags to large & outdoor flags. 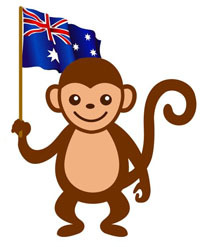 Flag Monkey is an online store, though visits to the Marrickville warehouse can be arranged by appointment. All online purchases are dispatched the same day & with express post usually arrive the next day. Trade and wholesale clients can contact Jay Thorogood, Flag Monkey’s owner-operator at jay@flagmonkey.com.au. Flags of All Nations is a specialist manufacturer of sewn flags using woven polyester bunting. 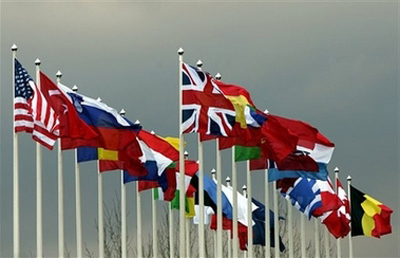 Flags of All Nations is a major wholesaler to the flag trade and supplies directly to the public and internationally. They supply a full range of fully sewn and printed Australian and international flags in different sizes. Custom made flags include flags for the Australian Defence Force, corporations and events, and school banners. Sewn flags (appliquéd) have a high quality that adds extra prestige and durability to the flags. They also supply indoor and outdoor flagpoles and undertake flag repairs. Harry West Flags is one of Australia's oldest flag makers, having operated since 1908, originally in East Balmain. It is specialised in expertly hand made appliqued flags and it also supplies screen printed and digitally printed flags. It makes a wide range of national flags, code flags and maritime flags. Custom made flags are produced in a range of fabrics and sizes for government, clubs, schools, corporates and individuals using customer supplied artwork and it can custom dye fabric to achieve accurate design. National Flags is owned by Ron Strachan, popularly known for many years as the The Flagman of Darwin. National Flags has operated for over 25 years and has relocated its Darwin shop after a brief period of being closed. A significant part of Ron's business is on the internet and he supplies wholesale to embassies, government departments, the Australian Defence Force and internationally. Ron has an enthusiastic interest in flags and is always willing to share his knowledge on flags and their usage. Palmer Flags has been manufacturing and selling quality flags for businesses, schools, clubs, real estate developments, golf courses, trade shows and special functions. Owned by Brad Palmer since 1981, the business is located in Queensland's Gold Coast. Flags are produced from 100% Australian-made woven polyester flag bunting, knitted lightweight trilobal polyester and 200 denier solarmax nylon using either screen printing or sewn (appliquéd). Palmer Flags supply the Australian National Flag, all international flags, commercial flags and vinyl banners, and a range of flagpoles are installed. Promex GmbH is an internet retailer of flags and flag accessories based in Konstanz, Baden-Württemberg, Germany. Promex operates as Flags.de on the internet and it supplies flags of all nations and many subdivisions. In addition it has an extensive range of hand wavers, car flags, lanyards, flag badges and friendship pins that can be customised into almost any combination. It specialises in high quality custom promotional products including lanyards, paper clips, magnets, silicon bracelets and baggage straps. Whilst the main website is in German, information on friendship pins is on a separate English website at www.crossed-flag-pins.com together with free downloadable animated flag gifs. WA Flags and Banners is a retailer of Australian and Western Australian flags, international and novelty flags. The firm sells a wide range of sizes from small table and hand-waver flags to large flags screen printed on woven polyester. It also supplies custom flags with the client's logo and designs. WA Flags and Banners is an online business without a retail store, contactable by email or phone. The firm aims to provide quality flags and banners at very competitive prices. There are a large number of other retailers and some manufacturers of flags and flagpoles in Australia. Listed below is a selection of these. Inclusion on the list (which is in no particular order) does not constitute a recommendation from Flags Australia. Note that many flag manufacturers and retailers have as their primary focus banners and signage for corporations, events and marketing rather than the national and international flags that are of most interest to flag enthusiasts.